1. They were being hunted by the Spanish. Did you know espionage was a part of the Lewis and Clark story? That’s right. The Spanish had their eyes on the American frontier as well. After the Louisiana Purchase, they were determined to stop American expansion. 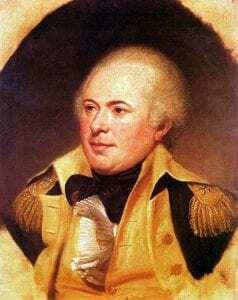 Enter James Wilkinson, a Revolutionary War hero and a man with a lot of debt. He began selling American secrets to the Spanish. This included details about the expedition west to find a route to the Pacific Ocean. The Spanish sent patrols after the Corps of Discovery, and at one point, got within 100 miles. Fortunately for the Lewis and Clark expedition, the Spanish never reached them. 2. 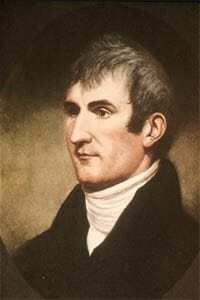 Meriwether Lewis was shot in the bum. Before taking a dive into how Meriwether Lewis ended up with lead in his bum, it’s important to introduce another character in the Corps of Discovery: Pierre Cruzatte. Part French and part Omaha Indian, Cruzatte was a linguist, hunter, and spirited fiddle player. He also only had one eye. During the return journey in 1806, Lewis and Cruzatte set out to hunt some elk. After wounding an elk, they went separate directions to pursue it. When Lewis raised his gun to take another shot at the elk, he felt a ball strike his “left thye about an inch below my hip joint”. Lewis knew right away that Cruzatte had made a mistake. In his journal, he wrote, “I instantly supposed that Cruzatte had shot me in mistake for an Elk as I was dressed in brown leather and he cannot see very well…” When he called out to Cruzatte, he received no answer. There could only be one explanation. They were under attack by Indians! But this wasn’t the case. Cruzatte, realizing he had shot Lewis, ran and hid. Later, when Lewis examined the bullet and confirmed it to be from Cruzatte’s gun, Cruzatte denied it all. 3. Lewis & Clark weren’t that important. Lewis and Clark’s contemporaries weren’t that impressed with the expedition. Jefferson, who conceived of the Corps of Discovery to begin with, barely spoke of it afterward. Why? Technically, they failed their mission to find a water route across the continent to the Pacific Ocean (to be fair, none exists). Even their route through the Rocky Mountains proved so useless that it’s still just a dusty, dirt road to this day. No one really talked about their epic adventures at first. Their journals were published a decade after their return but had little impact at the time. A revival of interest in the Corps of Discovery’s journey would not come until the beginning of the 20th century. Even then, interest waned during World War I, and America’s current infatuation with the explorers would not begin until the 1960’s. The Long Beach Peninsula was journey’s end for the Corps of Discovery. Walk in their footsteps for your own Lewis and Clark adventure! Pillar Rock – This is the location where Lewis and Clark first recorded seeing the Pacific Ocean. You’ll find Pillar Rock in Altoona, WA. Dismal Nitch – Terrible weather conditions pinned the explorers in this nitch for five days. Today, you can enjoy a picnic and great views from this rest stop managed by the Lewis and Clark National Historical Park. Middle Village-Station Camp – The site of a seasonal Chinook village where the Corps of Discovery camped for ten days. During this time, they surveyed and mapped the surrounding area. A Rocky Point (Discover Pass Required)- While exploring, Clark ascended a rocky point about 40 feet high where he got quite a view. This point is within present day Fort Columbia Historic State Park, one of the most intact historic coastal defense sites in the USA. Lewis & Clark Interpretive Center (Discover Pass Required) – The interpretive center is a great place to learn about the Corps of Discovery and enjoy panoramic views of the Columbia-Pacific Confluence. Maya Lin Confluence Project (Discover Pass Required) – Artwork (created by renowned artist Maya Lin) commemorating the Chinook people and the Lewis and Clark journey can be found at several locations in Cape Disappointment State Park. Locations are marked on the Cape D map. Discovery Trail – Named after the Corps of Discovery, the trail stretches 8.5 miles from Ilwaco to Long Beach. Find interpretive panels and art installments along the way to learn more about Lewis and Clark as well as Chinook heritage. Fort Clatsop – Fort Clatsop was the winter encampment for the Corps of Discovery. This park is located across the river in Oregon and makes a great day trip from the Long Beach Peninsula.